Will all last year’s winners and runners-up please return their league trophies to their pub/club or to a Committee member BEFORE the last game of the season. We need to prepare the trophies for presentation night and get them engraved with the new winners etc so they need to be back to us soon. Can all Secretary’s please check the spellings of their team members on the online system? If you have a chance of winning/runner up in your section or other trophy what is online will be what is on the plaque or cup. Drop the webmaster an email with the team name, section and player details to get it corrected. Steventon Sports Club Fun Day on Bank Holiday Sunday 30th August. Beer festival. Music. Bbq. Bouncy castles. Plus much much more. 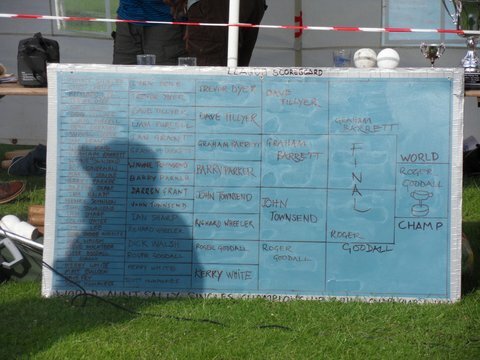 5-a-side Aunt Sally Competition – £15 a team entry. Come on down and enjoy a game of the finest game in Oxfordshire and sample one of our real ales in Oxfordshire biggest pub garden. See you on Sunday 30 August. If you know and play Aunt Sally you’ll know that Charlbury Beer Festival started the WORLD CHAMPIONSHIPS a few years back. Last year our own Abingdon League Barry Parker was runner-up in the competition going out to Henry Johnson of Yarnton of all places ! There aren’t many Abingdon players in the fray and there are a few places left – it’s limited to 32 playing all heats on the afternoon. It’s free to enter (past the Beer Fest entry fee) and there’s a trophy and the bragging rights of being a WORLD CHAMPION at something! See http://www.charlburybeerfestival.org/aunt_sally.htm for details and registration by email. Oh and there’s a Beer Festival which has great beer/ciders, food and entertainment throughout the day and proceeds to local charities. Entry is £10.00 and gets you 2 drinks tokens & the official glass. Non beer drinkers & Pimms drinkers £5.00 entry. Under 18s free. Enter the competition or go in support of our own and have a great day out!